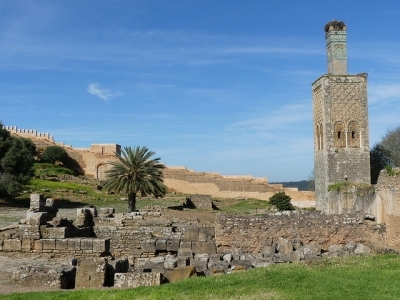 “Rabat, modern capital and historic city, a shared heritage” shows different construction phases from the Almohad period (12th century) up to the present day. The city was substantially modernized by the French from 1912 on, resulting in the Ville Nouvelle. I visited this WHS in April 2018. I used it as my base to cover another 2 WHS along the Atlantic Coast together with Casablanca tWHS before heading towards Tetouan. I felt that unlike the other medina WHS in Morocco, Rabat's OUV lies more in a series of separate outstanding buildings which help to understand the evolution of Rabat from "historic times" to nowadays. My hotel was situated right next to the Oudaias Kasbah which is best enjoyed at sunset. Sunrise over the neverending hills of tombs leading down to the coast, just behind the kasbah, is very worthwhile if you have time. After sunrise another view worth your time is the view of the kasbah and medina from the right bank of the Bou Regreg river in Salé. Apart from the medina itself, the true highlights during my visit were the unfinished Hassan Tower juxtaposed with the modern Mausoleum of Mohammad V with its splendid fountains and the interesting Chellah. Sunset is the best time to visit both sites. 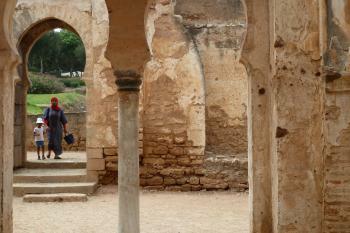 The Chellah is quite far away from the medina so its best to visit on your way in or out of Rabat. It is a medieval fortified Muslim necropolis with Phoenician, Roman and Muslim elements. The recently restored entrance gate to the Chellah necropolis is already an impressive sight to behold from outside the remparts. Inside the walled necropolis, the ruins of the Chellah sanctuary stand side by side with the Roman ruins of a basilica, walls, traces of mosaics and a funerary stele. The highlight of the Chellah necropolis ruins is the 13th century minaret with colourful zellig which has been completely 'dominated' by several storks which built their nest on top of it and on top of the crumbling remains of the Mausoleum of Abu Al Hassan (1351) and the adjacent medersa. In 1755, the Lisbon earthquake caused considerable damage to these remains. Behind the medersa most locals head to the Bassin aux Anguiles which was previously used as the mosque's ablution hall. Locals believe that the eels that now reside in it come from a miraculous source which they believe cures infertility. That is why locals feed the eels by throwing boiled eggs in the water. Besides the rather big eels, there's a turtle and a large fish too. All in all I enjoyed my 3 nights in the Moroccan capital and it can also be used as an alternative hotspot to Meknes/Fes if you hire a car. 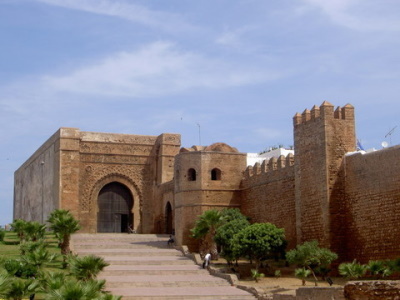 I don't think Rabat is one the usual tourist trail but it is worth a day or two. There's a good mix of places here that are part of the official WHS listing. The mosque that was never finished is fascinating - it looks like it could be ruins but the tower is complete, which should be a clue that actually it is just unfinished. The Kasbah is beautiful and great to explore. I would recommend going at sunset because it's at its prettiest then. And the old fortress of Chellah is also really interesting. There's not much left standing but you can get a good sense of what it was like. I would recommend staying in the medina and there are some really nice riads here. It is much quieter than the big medinas in places like Fez or Marrakech and you can easily spend some time exploring what it has to offer. 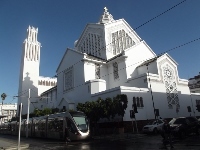 I travelled to Rabat by one of the frequent trains from Casablanca Port. The contrast between the old and new was most pronounced here, with the ancient Kasbah des Oudiadas on its rocky promontory only a short tram ride from the stark white structure of the Cathedral of St Pierre. Rabat may not be everyone's cup of tea but we ended up really enjoying our trip there. The official title of the WHS is a little cumbersome but does actually reflect the qualities of the site, highlighting the continuation of the urban landscape from the roman period to the present day. While some new towns in North African cities can seem sterile or lacking character, the one in Rabat doesn't just fall into being this sort of dead, commercial space - it is a living, essential part of the whole city. It was our introduction to the city, as we came in through the lovely train station being surprised by the cosmopolitan atmosphere and the hurry of bureaucrats heading off to their offices; it was almost like being back in London and I must admit this sense of home was welcome after a bit of time in the labyrinths of Fez. After admiring some of the architecture and some Italian food we headed off to see the more monumental sites. The Chella was our first stop, and on reflection was our favourite spot in the city. The drive there gave us great sweeping views of the city walls and once inside the mixture of Roman and Islamic ruins proved to be very entertaining. Perhaps our favourite part though was the gardens at the bottom where we sat listening to the trickling fountains whilst watching the storks fly back and forth from their comically large nests. A shared taxi took us to the Tour Hassan; the remains of a massive, uncompleted mosque. The tower was originally meant to be the largest minaret in the world, but it now sits at the end of a large square of partially erected pillars, leading to the elaborate though somewhat sterile modern Mausoleum of Mohammed V. After this visit we headed up to the Kasbah which is chock-full of pleasant winding lanes, whitewashed walls and some pleasant Andalucian gardens. It also offers lovely views across the harbour to the Salé, showing what was once the feared home of the famous Barbary pirates. From the Kasbah we had a nice stroll through the medina, which was very active but not as intense as many of the other royal cities in the country. 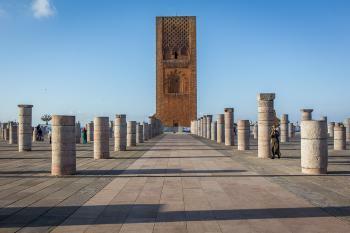 Rabat showed a mix of many different influences but here especially the relationship between Islamic and French ideas really worked well, instead of being two separate entities. Rabat manages to incorporate the wide boulevards of the French Ville nouvelle into the overall plan of the city making one unique whole, and also it is home to some pretty impressive Islamic sights (Chella, Kasbah, Tour Hassan). Whilst it may be stretching it to suggest that many would find this to be a highlight of Morocco I still think it is well worth a visit to find a coherent mix of the many aspects that make up contemporary Morocco. Modern Urban Planning: Criterion (iv): The city constitutes an outstanding and fully realized example of modern town planning, for a 20th century capital city, achieved by functional territorial organisation which incorporates the cultural values of the past in the modernist project. The synthesis of decorative, architectural and landscape elements, and the interplay between present and past, offer an outstanding and refined urban ensemble. Almohads: Hassan Tower "Founder of the Hassan Tower, Yaqub al-Mansur, was a member of the Almohad Dynasty"